Online fashion giants ASOS have created The Green Room – a section of the website dedicated exclusively to ethically produced fashion. As well as sustainable and Fairtrade clothing, here they showcase pieces which are made in the UK and the US. Also included is an eco glossary explaining green fashion terminology. This means buyers can get a better idea of the story behind how the clothes are made. Here are a few of our favourite pieces made from reclaimed fabrics. 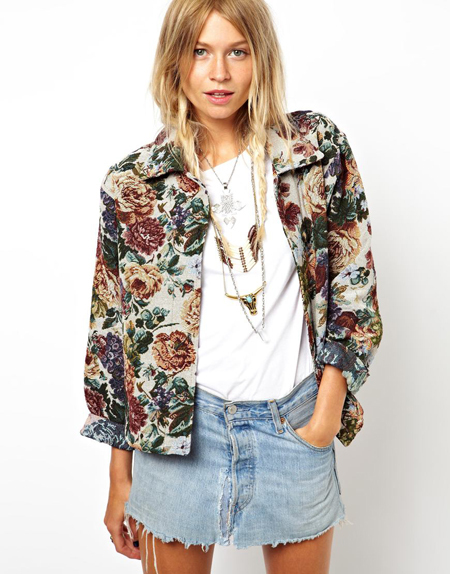 Above – ASOS Reclaimed Vintage Jacket in Tapestry Floral.